This month we released Sandvox 2.6.4. This update includes improvements to the iWeb site extractor, including much better extraction of exiting iWeb blogs, extraction of iWeb photo galleries, YouTube videos, and the ability to extract an iWeb site you have exported locally to your Mac. This should help tremendously for those that either did not extract their site before MobileMe expired, or who want to have another go with the improved extractor in 2.6.4. Plus, we’ve made a bunch of improvements to publishing, browser compatibility, and improvements for running with Mountain Lion. 2.6.4 is an important update and we’re excited to make it available! If you purchased Sandvox directly from Karelia, just let Sandvox “Check for Updates” and you’ll be all set. Or, download Sandvox manually. If you purchased Sandvox via the Mac App Store, you’ll see that the App Store still shows 2.6.1 as the current version. This means that the improvements listed above aren’t yet available through the Mac App Store. We’re hoping Apple will release our latest update soon, but it may be a few weeks and another update from us until they catch up. If you’re anxious to get these improvements right away, we do have a solution for you! Download Sandvox directly from Karelia. Replace the copy that the App Store installed in your Applications folder with the copy you downloaded. Sandvox will still recognize that you are a licensed App Store user, even if you are using an edition downloaded directly from Karelia. Once you’ve made that switch, Sandvox’s built-in update mechanism will continue to keep you up-to-date. Want to switch back to the Mac App Store edition later? Did you know that there are a number of additional Sandvox designs from talented designers around the world? We’ve made it easy to find additional designs for your Sandvox website. If you’re using the latest edition of Sandvox downloaded directly from Karelia, just choose “Discover Plug-ins…” from the Sandvox menu. 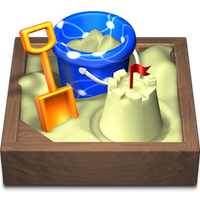 (Unfortunately this feature is not available on the Mac App Store edition of Sandvox due to Apple’s restrictions.) Or, just visit the Sandvox Designs section of our website. Here you’ll find the latest updates from Blueball Design, Kuler Solutions, BehindTheRabbit, and more! If you’re looking for a fresh look, we’re sure you’ll find something here that complements your website’s contents.